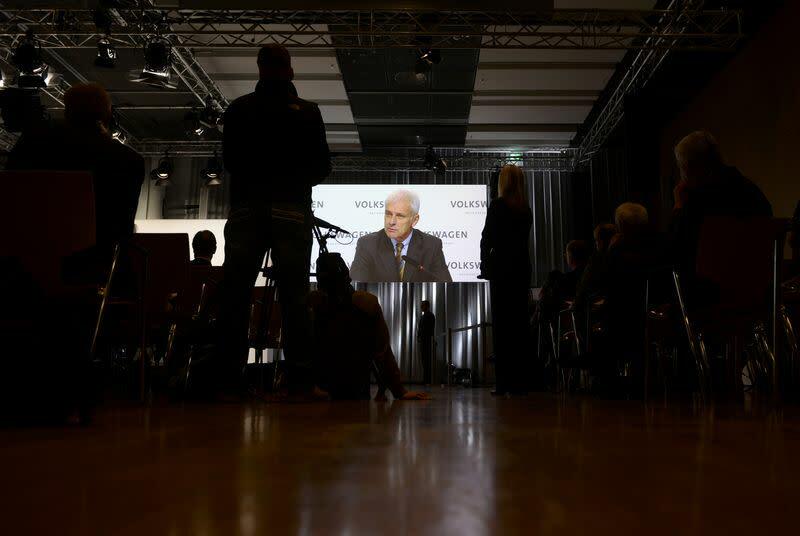 WOLFSBURG, Germany (Reuters) - Volkswagen (VOWG_p.DE) said on Thursday only a small group of employees was responsible for cheating U.S. diesel emissions tests and there was no indication board members were involved in the biggest business crisis in the carmaker's history. Chairman Hans Dieter Poetsch said investigations into the affair were going well, but the scandal was the result of a "chain of errors" and it would still take months to say which individuals were to blame. Europe's biggest motor manufacturer said it had agreed steps to improve oversight of engine-software development to avoid any future emissions test manipulations. It also hoped to reach agreement with U.S. environmental authorities in the next few days or weeks so the company can start to recall affected cars there. Cooperation with those authorities was described as "excellent". VW admitted in September it had cheated U.S. emissions tests and installed software capable of deceiving regulators on up to 11 million diesel vehicles worldwide, news that wiped billions of euros off its market value and forced out its long-time CEO. Some U.S. lawmakers were heavily critical of the company in the following days when it blamed a handful of rogue engineers, even though investigations were only getting underway. But VW's reputation was given a boost on Wednesday when it said another scandal involving the understatement of carbon dioxide emissions was not as bad as feared. "One could argue they should have revealed what they know a lot sooner than two-and-a-half months after the crisis started, but they are raising their game now," said Stefan Bratzel, head of the Center of Automotive Management think-tank. "It will be important to maintain that level of exchange with the public in coming months to prove they're serious about transparency." At 1625 GMT, VW shares were up 2 percent ay 134.4 euros, still down on their pre-scandal level of about 162 euros, but up from October's low of around 86 euros. Despite the scandal, orders so far this year were up by 3.5 percent and Chief Executive Matthias Mueller said he was confident drivers would get over their reluctance to buy the group's vehicles in the coming weeks. VW also said it was planning a new corporate structure that would be in place across the group by early 2017. The company was not considering the sale of any units to simplify its structure or raise money, and was happy with having 12 brands. But executives were still unable to estimate the scandal's legal costs, for which they had so far made no provisions. Analysts have said VW could have to pay out tens of billions of euros to cover regulatory fines, lawsuits and vehicle refits. Mueller, who has not been to the United States since becoming chief executive after the scandal broke, said he would visit the country for the Detroit motor show in January and contact authorities while there. Speaking at a news conference at VW's headquarters in Wolfsburg, Mueller said he would apologize for the situation, but added: "I don't think I will be going down on my knees there ... I will look ahead optimistically and confidently." "No business justifies crossing legal and ethical boundaries," Poetsch said. "Even though we cannot prevent misconduct by individuals once and for all, in future it will be very difficult to bypass our processes." Poetsch said an external investigation by U.S. law firm Jones Day was making good progress but would need time to reach conclusions. He said VW would not name any individuals involved on Thursday but it was likely only a small number of people took part in the deception. "We are talking here not about a one-off mistake but a chain of errors," he said, adding: "Based on what we know today, it was a very limited group which acted irresponsibly." Poetsch said he was not aware of any involvement of members of the management or supervisory boards in emissions test manipulation. VW's engine-development unit remained the focus of investigations, Poetsch said. Mueller said the crisis was an opportunity for VW to make long-needed structural changes. Since the start of this year, the VW group's executive board has brought in six new members, and top management had been changed at seven of VW's 12 brands. He said VW was working on a new structure to give more power to its regional divisions and brands. Details would be drawn up in the first quarter of next year and it would be in place across the group by early 2017. "There is no doubt that on the one hand there were weaknesses in our procedures ... and on the other hand we had an attitude of employees in middle management that was, as we say today, 'non-compliant'," he told ARD TV. Mueller said it was relatively simple and inexpensive to fix the affected cars, and he was often asked why they had not done so in the first place. The reason was that the technology for the fixes was not available when the cars were built, and the problem was not known at the time. "We will not allow the crisis to paralyze us," Mueller said. "Although the current situation is serious, this company will not be broken by it."